Vitamin B10, also called “the H2 vitamin”, “vitamin H ‘” or “para-aminobenzoic acid” is a water-soluble vitamin that can be synthesized by the human body. It is soluble in alcohol, chloroform, eter. Mushrooms, molasses, whole grains and spinach. Vegetables are a rich source of vitamin B10. These include carrots, potatoes and also wheat germ, rice bran, yeast, nuts, seeds. 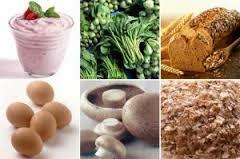 Dairy products, fish, cheese, egg yolks, liver, kidneys also have vitamin B10. Irritability, fatigue, gastrointestinal problems, depression, graying hair. PABA may interfere with the effect of sulfonamide (some antibiotics) drugs. A high dose of PABA may cause side effects such as low blood pressure, rash, fever and in rare cases liver damage. Para aminobenzoic acid ( PABA ) has a role in the pigmentation process, is an antioxidant vitamin that rejuvenates the body, has antibiotic effect, is necessary for the synthesis of folic acid , pantothenic acid ensures assimilation , protects skin from UV rays , facilitates blood cell formation , regulates the metabolism of proteins, detoxifying . PABA is indicated in: allergic disorders , immune disorders , deficiency diseases, dermato-venereal diseases, digestive, genital, muscular, neurological, ophthalmological, osteo-articular, respiratory, infectious diseases, poisoning and environmental agents. Diseases caused by excess of para aminobenzoic acid can occur when administered vitamin synthesis, causing nausea and vomiting. Alcohol, coffee and sulfonamides inhibit the production of B10 vitamin , as well as thermal processed food. Para aminobenzoic acid has strong antioxidant properties and is therefore recommended for cosmetic products – balms, shampoos, lotions – that help in the treatment of skin and hair health. Para aminobenzoic acid (PABA) is very useful in preventing the formation of wrinkles and thus help in fighting premature aging of the body. It also has a role in protecting the skin from potential summer sunburn due to UV radiation. Vitamin B10 helps hair growth, protects and control the appearance of prematurely gray hair. Doctors recommend Vitamin B10 for nursing women because it has a role in promoting milk production. Vitamin B10 is very important because it has miraculous properties. It is involved in the production of red blood cells, in the digestion of proteins, helps provide oxygen to cells. An important role is to relieve pain from headaches, nervous states, in eliminating the sensation of fatigue, in the treatment of nervous disorders and digestive.